No, you will not be able to buy a diesel Jaguar F-Type in the United States you perverse human beings. You will, however, be able to buy every other Jaguar, Land Rover, or Range Rover with a proper oil-burning engine (and an F-Type with a stick). Not bad. There wasn't much news I hadn't heard or hadn't expected at the Jaguar Land Rover press conference this evening in Detroit, which still rages behind me. If you're an analyst, you'll be interested to hear that Jag's North American chief Joe Eberhardt telegraphed that 2015 sales will be "flat" as they have little new product to excite more growth. The big year is 2016, they say, as the Discovery Sport and XE go on the market. What a year 2016 will be: We're have an F-Type with a stick and AWD. We'll be closer to the F-Pace "performance crossover" that Ian Callum said would be competing with the Macan. They can't show it to us because, as Callum said, they're still working on it. Expect it to look like the CX-17 Concept. The new XE will be coming forth with a lusty diesel powertrain, as also previously reported, and while they're at it all Ranger Rovers and Land Rovers will be getting diesels, too. Smaller vehicles like he Jaguar XE and, I presume, the Evoque will get the 2.0-liter four-cylinder turbodiesel while larger vehicles like the Range Rover and XJ will have a version of Jaguar's 3.0-liter diesel that puts out 254 horsepower and 440 lb-ft of torque. In terms of specs, that's similar to the diesel engine I tested in the XF Sportbrake and it is quite good, offering the sweetspot of pants-tightening torquey-ness with penny-tightening fuel economy. 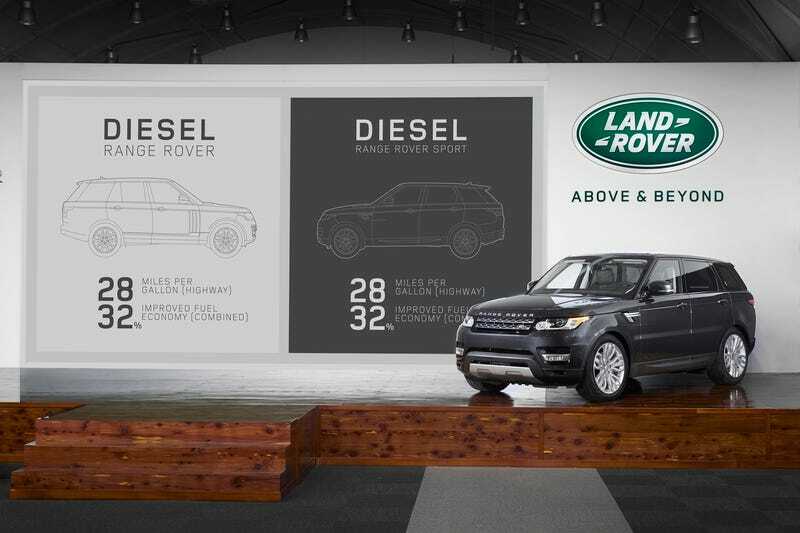 In the big Range Rover, expect 28 MPG highway and 25 MPG combined. By comparison, the old Range Rover got roughly the same gas mileage as a Sopwith Camel with no wings. Manuals. Diesels. It's a good time to have money.